Lawrence, MA – March 19, 2015 – Solectria – A Yaskawa Company, a leading U.S. PV inverter manufacturer, announced the introduction of its Rapid Shutdown (RSD) Combiner for single-phase inverters. 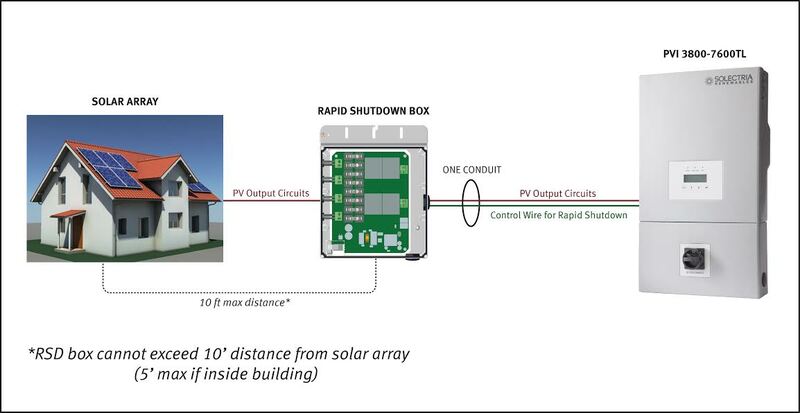 This RSD Combiner option offers a complete solution to NEC 2014, Article 690.12 requiring rooftop installations to de-energize conductors outside of a 10 foot boundary from the array. The RSD Combiner has been designed to integrate seamlessly with Solectria’s PVI 3800-7600TL singlephase, transformerless inverters. It allows for operation of dual MPPT zone configurations with two strings per MPPT zone. The inverter provides a signal to enable or disable the RSD Combiner. If the RSD Combiner is enabled, the array automatically, upon loss of AC power at inverter, shuts down the system without an additional power supply, disconnect or activation switch. Solectria’s PVI 3800-7600TL singlephase transformerless inverters and rapid shutdown combiner solution is fully-integrated and is the simplest way to achieve compliance with NEC 2014, Article 690.12. “Our residential inverters are the most robust, versatile and efficient inverters in the solar market today. It is extremely important to be compliant with NEC with a solution that integrates seamlessly to facilitate ease-of-installation. Our residential solution provides this to our customers,” said James Worden, CEO of Solectria – A Yaskawa Company. Solectria – A Yaskawa Company, a wholly-owned subsidiary of Yaskawa America, Inc., is a leading U.S.- based grid-tied PV inverter, combiner & web-based monitoring manufacturer for residential, commercial & utility-scale solar projects. Solectria’s products include 3.8 to 750 kW inverters. Solectria is backed by over 100 years of power electronics and inverter experience. All of Solectria’s three-phase central inverters are made in the USA. PV System owners, developers and EPCs rely on the high performance, reliability and bankability of Solectria – A Yaskawa Company. To learn more, please go to www.solectria.com.